ACLU: How many LEOs does it take to subdue peaceful protectors? I posted a video on my Facebook page.. instructing how to use cotton to prevent frostbite.. wanting this info to get to everyone at Standing Rock! Please help get this out! Thankyou for this upate. 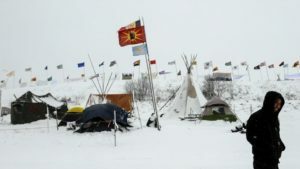 Occurs to me that since constabulary of all various inappropriate forms are coming from all over to this specific resistance location at Standing Rock,that the importance assigned to successful quelling of this resistance by corporate power establishment is apparent as demonstration nationally of the futility of resistance to inevitability of aggressive state actions carried out by police types doing the will of their paymasters. So: the response by those of us in support of the Water Protectors (who are representing us all) is to Decentralize Protest: Demonstrations where we live spreads the truth all over the country AND points out that while police types have gone to support their big corporate money masters in ND, at home the people still recognize the truth and this will spread like a prairie fire. Some of us aren’t strong enough to join you but we can use our computer printers and get info sheets under car wipers.